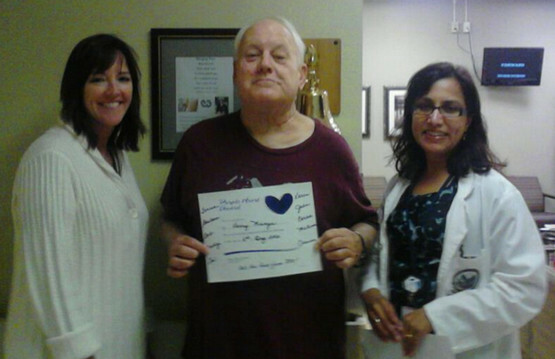 His radiation tech, Skip Munger, and Dr. Talwar his oncologist after his last treatment. At 12:23 am my heart and world shattered when my hero took his last breath with me laying next to him. Exactly one month after being diagnosed with carlangio carcinoma and admitted. Dad, you fought every battle health or otherwise with strength and dignity and we know you were tired. You will forever be the biggest part of me. Please continue to watch over us! We still need you. Hopefully, Sugar was there waiting. Rest easy Daddy. You deserve it. I miss you already. For those of you who aren’t friends with us on Facebook. I’m sorry it’s taken me so long to post this but, I’ve been at my fathers bedside daily. On the 7th I took my Dad in for a routine oncology appointment expecting results of his liver biopsy. As I was pushing him in a wheelchair he got jaundice and was immediately admitted to the hospital here in Tampa. He apparently caught the parasite that causes carlangio carcinoma in service in Vietnam. And the veterans administration caught it too late for any treatment options. We have been treating him aggressively with radiation (our only hope and called a Hail Mary by his doctors). His condition has worsened daily and at this point ALL PHONES have been taken from him for his safety. I have his cellphone. If you would like to speak to him, please contact me and I will make that happen. I can’t promise in his condition he will know who you are but, I will try my best. He will probably be moved to the hospice unit on Wednesday. As his doctors have advised me he probably would not be safe coming home in his condition. I would like to thank everyone of you for your friendship to my father. He truly loves each one of you. I cannot tell you how much your friendship improved the last few years of his life. And he asked me to make you all aware of his situation. He is until his very last breath my very best friend who has held my hand for 33 years. I will hold his through this. The Munger family thanks you. He has officially given his life in service to his country. Be the first to comment on "A Salute to Skip Munger"